Gaming, whether with traditional board games or new, modern gaming, can help improve critical thinking, hand-eye coordination, and encourage problem-solving. Check out these games that are sure to capture a teen’s attention! The goal of the game is not to explode! Players draw cards from a common deck and lose if they draw an “exploding kitten” card. Players can draw other cards that will help them lessen the chances of drawing such a card. One of the strengths of this game is the humor. While it will not appeal to all players, many have found it funny — cards such as “The Beard Cat,” “Catermelon,” and the “Nope” cat — reflect some modern Internet humor. It’s easy to learn and does not require much thinking, but one can make it more challenging and exciting by using card combinations. It does not require any kind of prior knowledge. This would be perfect for teens during a hang-out session or sleepover, or an afterschool activity in the library. Love cats? Love explosions? Play Exploding Kittens. 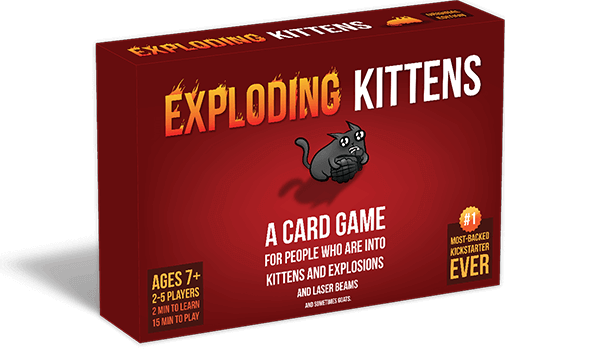 Looking for an easy card game — one with kittens and/or explosions? Try this game that will leave you laughing. It’s very easy to learn and fun to play competitively. You can use strategy to play, but you can also play casually. Modern/Internet humor adds to the allure of the game. Playing on teams, each player must describe a word to their partner without using certain words. As the partner guesses, a timer runs and teams gain points for ever correct guess. The team with the most points win. This is a classic game for a reason — it promotes teamwork, quick thinking, and creativity, without being boring. This is a perfect game for teens as it encourages them to think outside the box and learn how to best communicate with others — each person you play with may have a different way of understanding your concepts, and so to win, you would have to learn how they think. The squeaky toy makes it fun to “buzz” when a player uses the wrong word, and the hourglass makes the game fast-paced and competitive. When there’s some things you just can’t say . . . play Taboo! Play a timeless game that will inspire your competitive spirit! This is a classic game that requires some thinking! With the timer, it’s fast-paced but still accessible to all types of players. Each player gets three cards with captions. An independent judge/moderator chooses a photo and each player matches their best caption to the photo. The moderator chooses the best caption! Although the teens would not write their own captions, the game does encourage creativity and strategic thinking — maybe it would be wise to keep this card that does not quite match the situation, and wait for a more perfect photo? It is a fun, hilarious game that could be well-adapted to playing with family, younger siblings, and peers — it is easy to make it as innocent as one wants. With so many photos, it would take a long time to go through them, so the game could continue to be fun for a long time. May the funniest caption win! Bring a sample caption and card, and choose three teens, and have the class vote for the best match! This is a very easy game to play; while it can be played by younger children and families, it is still fun for teens and adults, as teens can think more creatively with their captions and apply any pop culture references or other contexts to the photos. It’s a great game to play a bit at a time!